Two Front Cushion Pads. Non-slip backing interior softer, water resistant, and more breathable. Cushion Covers. Front Sets. car covers. rubber floor mats. 3-row carpet floor mats. carpet floor mats. Leather Steering Wheel Covers. Leather seat Covers. Top Quality PU Leather Steering Wheel Cover. Fabric seat covers. Full Complete Car Seat Covers. 3 Row seat covers. Protects your Seat. 2 Front Bucket Covers. 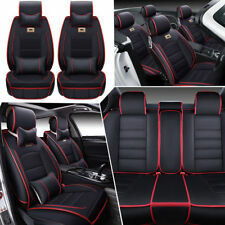 Universal Car SUV PU Leather Seat Covers US 5-Seats Luxury Cushion W/Pillows Set. Head design is simple; binding is wearproof; EMB process is stylish and elegant. Matched with neck pillow and lumbar pillow, it can relieve your fatigue. Features Premium PU leather, breathable and wear resistant. Soft touch and easy to wash with wet cloth. Car Seat Covers. Car Steering Wheel Cover. Car Accessories. Adjustable and detachable rear bench, free to fit different seat sizes. Complete Full Seat Covers Set for Car SUV Van Truck with Silicone Cup Holder Combo. Silicone Cup Holder. Fabric seat covers. Leather seat Covers. 3 Row seat covers. Protects your seat armrest. Two Front Bucket Covers. Complete Full Seat Covers Set for Car SUV Van Truck with Anti-slip Dash Mat Combo. Anti-slip Dash Mat. Fabric seat covers. Leather seat Covers. 3 Row seat covers. Protects your seat armrest. Two Front Bucket Covers. 3 Row Top Quality Faux Leather Car Seat cover Full Set for Auto Car SUV Truck Minivan. 3 Row seat covers. Full Complete 3 Row Car Seat Cover Set. Leather seat Covers. Universal application fits almost all seats ( Cars, Trucks, Vans, & SUV ). Front Bucket Seat Covers Combo with Dash Grip Mat. Two Front Bucket Cushion Covers. Leather seat Covers. Fabric seat covers. 3 Row seat covers. Super easy installation, simply put the covers on and they will stay in place. Free Air Freshener. Material:PU Leather with Advanced Stitching, Premium PU leather with sophisticated stitching design that is soft to the touch, water resistant, and durable. Leather seat Covers. Fabric seat covers. Material: PU leather sponge non-woven fabric suede. Seat cover. Whole surrounded design protects the seat well, easy to install,practical. Facing is comfortable wearproof PU leather and filling is elastic sponge. Leather Fron Bucket Cushion Pads with Silicone Steering Wheel Cover. Non-slip backing interior softer, water resistant, and more breathable. Two Front Cushion Pads. Leather seat Covers. Fabric seat covers. Material: PU Leather. Detachable and adjustable rear bench, free to fit different car seats. Full surround design, easily protect your seats against spills, stains, fading, tearing, crumbs, pet hairs. One Rear Bench Cushion Pad. Leather seat Covers. Fabric seat covers. 3 Row seat covers. Material:Top quality faux leather backed with high density foam and non-slip silicone interior. Headrest Covers. All Weather Floor Mats, Seat Belt Pads with Steering Cover. Protects your Seat. New Look For Your Car. Complete Protection for your Vehicle Interior. International Orders. Carpet Floor Mat. Leather seat Covers. Full Complete Car Seat Cover Set. Material:Faux Leather w. perforation, Highest grade faux leather with center perforation that is soft, water resistant, and more breathable. 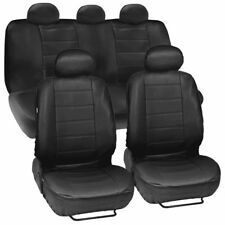 Black PU Leather Car Seat Cover Deluxe 5 Seats SUV Front & Rear Cushions Mat Set. Car Seat Covers. Material: PU Leather. Car Steering Wheel Cover. Full surround design, easily protect your seats against spills, stains, fading, tearing, crumbs, pet hairs. Universal application fits almost all seats ( Cars, Trucks, Vans, & SUV ). Fabric seat covers. Leather seat Covers. 3 Row seat covers. Steering/Belt Pads. Complete Seat Covers Mats Combo. The world of auto decoration. Car Truck Seat Cover PU Leather 5 Seats Front Rear Cushion All Seasons Beige L. Material: PU leather sponge non-woven fabric suede Weight: 4.5kg. Seat cover. Whole surrounded design protects the seat well, easy to install,practical. Complete Full Seat Covers Set for Car SUV Van Truck with Silicone Steering Wheel Cover Combo. Fabric seat covers. Leather seat Covers. 3 Row seat covers. Silicone Steering Wheel Cover. Protects your seat armrest. Car Seat Covers. Material: PU Leather. Car Steering Wheel Cover. Full surround design, easily protect your seats against spills, stains, fading, tearing, crumbs, pet hairs. Detachable and adjustable rear bench, free to fit different car seats. Full Set Seat Covers for Highback Seats. Two Front Highback Bucket Covers. Includes Two Front Highback Bucket Seat Covers, One Rear Split Bench, Headrest Covers with Rubber All Weather Floor Mats. Universal application fits almost all Highback Seats Vehicles ( Cars, Trucks, Vans, & SUV ). Material:Waterproof Neoprene with Non-Slip Backing, premium neoprene with non-slip interior. Floor Mats. Fabric seat covers. Leather seat Covers. 3 Row seat covers. Heavy Duty Floor Mats. Rear: bench backrest and bottom covers both have three zippers on them to accommodate left and right and 50/50 splits. 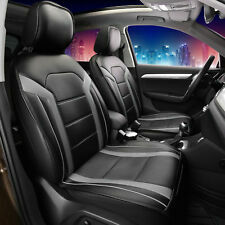 Universal Car SUV Faux Leather Seat Cover Breathable Comfortable Full Cover Pad. Car Seat Covers. Car Steering Wheel Cover. Material: Polyester Fiber. Car Accessories. High quality leatherette material, smooth and comfortable touch. One Rear Split Cushion Cover. Leather seat Covers. Fabric seat covers. Full Set Seat Covers Combo. 3 Row seat covers. Silicone Steering Wheel Cover. Two Front Bucket Covers. Headrest Covers. Features Premium PU leather, breathable and wear resistant. Soft touch and easy to wash with wet cloth. Full surround design, better protect your car seat against dirt, spills, stains, crumbs and pet hairs. Material:PU Leather, Premium PU leather with a protective coating that is soft to the touch, water resistant, and durable. One Zipper extention Connector for Bench Cover. Carpet Floor Mat. Leather seat Covers. Leather seat Covers. Full Complete Car Seat Cover Set. Material:PU Leather, Premium PU leather with a protective coating that is soft to the touch, water resistant, and durable. Fabric seat covers. 3 Row seat covers. Complete Interior Combo Set includes: Two Airbag Compatible Front Bukcet Seats Covers, Rear Split Bench Cover, Headrest Covers with Rubber Steering Wheel Cover. Universal application fits almost all seats ( Cars, Trucks, Vans, & SUV ). Two Front Bucket Cushion Covers. One Rear Bench Cushion Covers. Leather seat Covers. Fabric seat covers. 3 Row seat covers. Full Set Seat Covers. Material:Top quality faux leather backed with high density foam and non-slip silicone interior. Leather Fron Bucket Cushion Pads with Silicone Steering Wheel Cover. Non-slip backing interior softer, water resistant, and more breathable. Two Front Cushion Pads. Silicone Travel Cup Holder. Leather seat Covers. Material:PU Leather, Premium PU leather with a protective coating that is soft to the touch, water resistant, and durable. Materials are Made from Durable & Comfortable Breathable PU Leather- Easy to Wipe Clean, Air dry.